The Beatles were known for their irreverent attitude – as can be seen in photos from RTÉ's Stills Library. At a publicity photo shoot in the Gresham Hotel on 7 November 1963 before their Dublin concert, RTÉ presenter Paul Russell’s attempts to interview them were complicated by their boisterous mood. 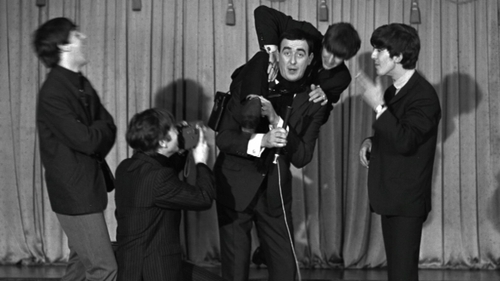 One photo shows Russell pushing George Harrison during some horseplay, while another sees George light a cigarette and place an ashtray on Russell's shoulder. Another shot shows John Lennon putting a camera strap over Russell's shoulder, before Ringo climbs on Russell's back with his leg over his shoulder. Russell shook him off, with Ringo ending up on the ground. Finally, the Fab Four took control of an RTÉ camera.